Holy Toledo. 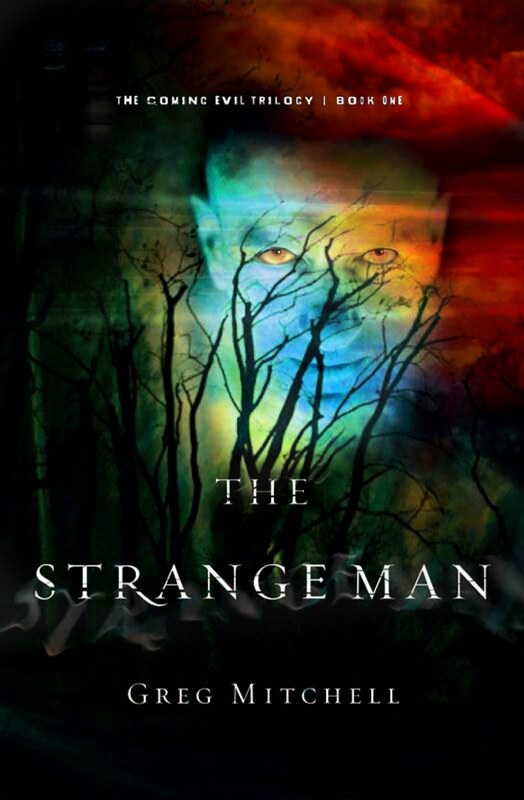 The Strange Man is like a train wreck -- horrifying but you can't look away. In the dying town of Greensboro, there have always been rumors about a bogeyman living in the North Woods. Parents tell stories of the bogeyman to get their children to behave. Some believe, some don't. Dras (pronounced "DrAHz") Weldon is a twenty-something who is unemployed, drinks heavily and, in general, refuses to grow up. He collects action figures and sponges off his family. His only real friend is Rosalyn. She came from a disastrous, alcoholic home and has been labeled "trash" by pretty much everyone but the Weldon family, with whom she practically grew up. Rosalyn is patient to a fault, when it comes to Dras. Dras questions his faith aloud and is rebellious, but he really believes in God. He just doesn't want to think about it and he both acts and speaks as if he's not a believer. One night, a storm moves into Greensboro -- a very odd storm that carries with it the sensation of evil. The bogeyman has arrived. He is, in fact, the devil and he brings along his legion of demons. Because the town has moved away from Christianity, they've allowed the devil to be freed from his prison in the North Woods. And, he means to wreak havoc, kill and ruin lives, wherever he can. Death comes quickly, once the so-called bogeyman arrives. The devil-slash-bogeyman can appear handsome and suave but sometimes he shows his true form. Dras, as it turns out, is getting in the devil's way. The devil has his eye on Rosalyn but he can't harm Dras. And, Dras is not going to watch his friend get tortured or worse and do nothing about it. But, will he be able to save Rosalyn? There's only one thing Dras can do and it may mean sacrificing his own life. Man . . . talk about creepy. This is one heck of a scary book. I cannot believe I read it at night and didn't have nightmares, but I just couldn't put it down so I finished The Strange Man in the middle of the night. You should see the dark circles under my eyes. I meant to snooze late but the cats decided to have a party on my head very early Monday morning, so I guess I'll just have to catch up on sleep. It was worth it. The Strange Man is riveting. From a Christian standpoint, I had a little trouble with the fact that a person could pray for help and still end up shredded (Ewww!) but in the end there's one person who actually succumbs not to the devil but to the evil of man. To be honest I just can't fault a book too much if it's that hard to put down. I loved the fact that The Strange Man is gripping, has a good solid theme about God as protector and that we choose whether or not to let evil into our lives, and I liked the characters -- although there were moments I wanted to reach in and shake someone. You know those scary movies where you're muttering, "No, no, don't open the window! Don't go outside!" or whatever. Yeah. It's like that. Adding this to the post, a bit late. I think there's another theme, which is really important, and it's something to the effect of, "Watch out what you say and how you behave; the people around you learn from your actions and words." Dras actually leads people away from God. Oops, I think I already mentioned that, above, the fact that someone got shredded even after praying. Well, that's about it. The Strange Man is, I think, technically a Christian book because of the publisher and the God-driven theme. But, I left that out of my header because, you know . . . I have a real quibble with the fact that a lot of people will pass this book up (and a lot of other titles) merely because it's written from a Christian perspective. And, it's not like Hollywood hasn't done the devil-coming-to-get-everyone, complete with a hell-fire spouting, mildly hypocritical preacher and all that. I just read True Grit last week (I'll review it, soon) and found myself thinking about the way Christianity in characters was common not that long ago but has become something to avoid in recent decades. In True Grit, Mattie's Christianity really jumps out at you, the way Mattie quotes the Bible and talks about being a good Presbyterian. It's simply a part of who she is, but it's something we don't see all that much anymore. I found myself wondering . . . Would that book be considered (if it were a new title, that is) by a mainstream publisher, these days? I don't know. I have a feeling the answer is "no," though. In The Strange Man, the preacher is Jeff, the "prodigal" Dras's brother. He's not perfect; nobody is, although Jeff's wife comes closest. She's a peacemaker and a solid, kind woman. Many of the characters are not Christian. That's part of the point -- so many in the small, dying town have lost their faith that they've opened themselves up to evil. It's really just a typical good-versus-evil plotline and it deserves a wide readership because it's a rollicking good, shaking-in-your-boots kind of story. That is my humble opinion. Click here to read a free chapter of The Strange Man and view the trailer (which, honestly, I'm afraid to watch). Be sure to look at the author photograph, which was taken by his 4-year-old! Awesome. Cover thoughts: Cool. Creepy. Perfect. Love the colors. I've been offline, apart from brief hops to the blog to approve comments, via the iPad, because my computer has been covered by a tarp while Huzzybuns repaired the damaged wall in my office and sanded in preparation for painting. So . . . not sure when he's going to get around to painting the walls but if I disappear abruptly for a couple of days, never fear. It probably just means I've been banned from the room. I get in his way, you see. I'll try to catch up on visiting people when he's not around and I'm not busy shooing the cat away from live electrical cords. That animal. Sheesh. Izzy, that is. She's a handful. This weekend, I spent a lot of time reading, reading, reading. I picked up Haunting Jasmine, the story of a woman fresh from a divorce, who goes to take care of her aunt Ruma's bookstore while Auntie Ruma makes an emergency trip to India. Ruma doesn't bother telling Jasmine that the store is haunted. It was a case of perfect book for the time and I raced through it, loving every minute. I'll review the book, soon. After reading Haunting Jasmine, I spent a day catching up on my Bible study, which involves a humongous amount of homework (I missed the first week, thanks to a stomach virus). And, then I picked up The Strange Man and there went a good night's sleep. I've got to get off the computer because Kiddo wants me to quit tapping so he can sleep, but I'll try to post a pic of Izzy playing with her rubber ducky in the next post. Betcha can't wait. I've awakened to weather that is threatening to turn severe (tornadoes and thunderstorms) and a headache, so blog-hopping and my next review will likely be delayed a bit longer while I hide in my room to read and sleep. I'm really starting to miss you guys. I'll at least approve comments if I don't have to unplug everything. While we were still waving we saw Suzanne slip off Philip's back and run toward us at top speed. She tumbled into the midst of us, shaking from head to foot. "They're coming! They're coming!" she yelled. And suddenly Philip and George were also among us, panting. "They're coming! They're coming! The Nazis are coming!" "What?" we shrieked, and we all raced up the slope and looked, the smaller ones taking turns on Philip's back. Far, far down on the valley road two green spots with helmets moved toward us on bicycles. We looked at one another, terrified. Then I don't know how but Henry, Arthur, Denise, and I, we all said at once, "The cave!" And we ran toward the back of the house. The others followed us. Kiddo and I recently cleaned out one of his cabinets, tossing out junk and setting aside children's books to donate. And, one of the books we came across -- which Kiddo promptly added to the donation pile -- was Twenty and Ten. I was intrigued by the cover image of a Nazi sitting on a rock while children peek out of a cave behind him, so I set the book aside and read it the next day. 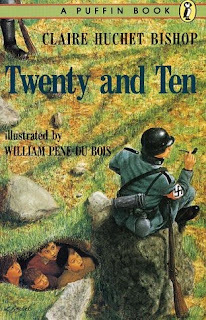 Published in 1952 and penned by a Frenchwoman from Le Havre whose grandfather was the village storyteller, Twenty and Ten is based on a true story. And, I must say . . . it certainly has the tension of a real-life Nazi story. The story is about twenty children who are living and attending school together with their teacher, a nun named Sister Gabriel, safe in the hills above their French village. Most of the children are the same age -- about 11, as I recall -- but one of them is the younger brother of one of the girls and he's only 4. As the book opens, the children are playing a game called The Flight into Egypt about Mary, Joseph and Jesus, and arguing about who gets to play the roles of Mary and Joseph. It's WWII and France is occupied by the Germans, but the children and Sister Gabriel live a fairly comfortable life. Rations are tight but they argue and play like children everywhere in spite of growling stomachs. Then, one day a young man shows up dirty and starving with ten Jewish children in tow. He asks the nun if the children can stay because he thinks they'll be safest around other children. Warning: I tell about this story in quite a bit of detail so there may be some spoilers. If you plan to read the book soon, skip this part. Sister Gabriel and the children agree and the children slowly adapt to each other. At some point, they discover a cave on the school grounds, but it's not till they're playing in the cave and think of the Nazis that they realize the value of their find. And, soon it comes in handy. One day, Sister Gabriel must take the hour-long walk to town to fetch the mail and she doesn't return. The children are on their own. The Jewish children hide in the cave, one of the boys is taken to a barn and beaten because the Nazis are convinced the missing children are somewhere nearby, and he escapes briefly to let the children know what's happening to him. The children work together to make sure their Jewish friends in the cave are provided with food and water. Then, the youngest child says something that sounds like a confession that Jews are nearby to one of the Nazis. Will the Jewish children be found and taken away? End spoiler alert. It's safe, now. I was surprised at what a nail-biter Twenty and Ten turned out to be and, of course, I loved the way the children used their heads and courageously worked together. I don't know if Twenty and Ten is still in print but it looks like ours was the 22nd printing, so I'd guess it's likely still around. Highly recommended for children and adults. And, isn't the cover stunning? There are also illustrations inside, by William Pene du Bois, whom you may know as the author of the Newbery Award-winning book The Twenty-One Balloons. I'm pre-posting this review and will be taking a few days off from the blog while the weather is nice. Not sure when I'll be back, apart from sometime next week. If you leave a comment and don't see it for a couple of days, don't panic! I moderate comments so it might take me a while to get to them. I'll leave you with a picture of Isabel deciding what to get into next and see you next week! Even if it wasn't misty or if the sycamores didn't quite line up perfectly, you'd imagine that they did. It's so synesthetic, that part of the world. That wet air carries everything with it. Those places are so humid and damp and all the antiquity lingers in the air. I received a finished copy of Paris Was Ours in a surprise package from Algonquin Books and you should have heard the squeal. It just happens to be one of the books that most interested me from their catalogue, but I wasn't going to request anything from Algonquin simply because I've got enough advanced readers to carry me through till at least April. But, Paris! I've only been there briefly but the idea of Paris still entrances me and the memory of how it goes from dull and gray when overcast to sparkling and golden when the sun emerges has remained with me. I carried Paris Was Ours straight to my reading spot and started reading the essays the evening the book showed up. Michael of Algonquin's marketing describes Paris Was Ours as "a delicious treat for the armchair traveler," and that's an apt description, in my humble opinion. Thirty-two essays cover the same ground from a wide variety of different perspectives but there are vast differences in experience along with some telling crossover. Many of the essayists mention the immaculate gardens upon which even adults are not allowed to set foot. No playing frisbee or lounging in the grass is allowed. Even a foot placed on the delicate turf will result in a fierce, "You should know better," whether one is a toddler or a 40-year-old. "Children in France are seen but not heard," says one American friend, Katherine, who is a mother of two. "Except on the playground, where the parents don't get involved and then it becomes Lord of the Flies." Let me skip ahead to what I liked and disliked about the book before sharing a lengthy quote that I think is amazing but also gives slight evidence of one of the book's troublesome aspects. I absolutely adored the learning experience of reading about the French culture as written by a large number of people who have lived in Paris or still do. I can honestly say I never really understood the French. I found my own experience was 50-50 on the friendly scale. When I purchased a little silver Eiffel Tower charm from an elderly man in Montmartre, he spoke in careful English and even wrote the number of francs on one palm with the finger of his opposite hand. What a sweetheart! But, we had one of those French waiters . . . the famously snobbish fellows who refuse to listen to garbled English-French, a man who actually slammed our plates onto the table. Their attitude -- both the kinder French and the snobs in restaurants -- are described in depth and their motivations explained from a variety of angles that truly make sense of the culture, the personalities, the differences in the way women look and men treat them, how their children are brought up. 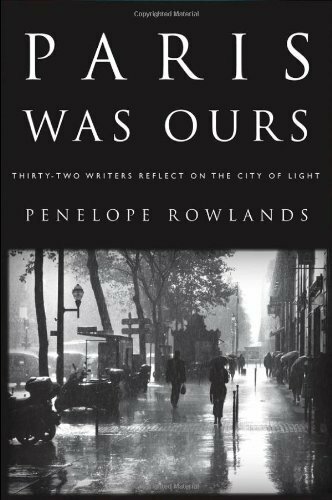 The word pictures painted by essayists in Paris Was Ours give readers a surprisingly three-dimensional view of a lifestyle and culture. My first thought when I read each of the essays was always, "Okay, I wonder when this person lived in Paris." Paris of the Sixties may have been very different from Paris of the Nineties, so I thought that was important information. Sometimes the time period is mentioned, sometimes it's not -- often you're well into an essay before the time period is revealed. There are brief bios of each of the authors in the back of the book. I would have liked to see those bios on a separate page preceding each essay, complete with dates to give each essay context. The other problem I had was that most of the essays were peppered with French expressions but there is no glossary. For those who know French well, that's likely not a problem. But, I had junior high and high school French -- only enough to translate the easy words like "fromage" and "patisserie" that probably everyone knows. A glossary would have been very, very helpful. Eventually, I began marking words to look up, but there were so many of them that I should have just kept a laptop nearby, for translating purposes. The French have such an attractive civilization, dedicated to calm pleasures and general tolerance, and their taste in every domain is so sharp, so sure, that the foreigner (especially someone from chaotic, confused America) is quickly seduced into believing that if he can only become a Parisian he will at last master the art of living. Paris intimidates its visitors when it doesn't infuriate them, but behind both sentiments dwells a sneaking suspicion that maybe the French have got it right, that they have located the just milieu and that their particular blend of artistic modishness and cultural conservatism, of welfare-statism and intense individualism, of clear-eyed realism and sappy romanticism -- that these proportions are wise, time-tested, and as indisputable as they are subtle. If so, then why is the flâneur so lonely? So sad? Why is there such an elegiac feeling hanging over this city with the gilded cupola gleaming above the Emperor's tomb and the foaming, wild horses prancing out of a sea of verdigris on the roof of the Grand Palais? The true mean; a just medium or balance between extremes; specifically, judicious moderation, as between extremes of opinion or conduct: defined as a political term by Montesquieu, but first brought into common use by Louis Philippe in 1831 in characterizing his own system of government. The term flâneur comes from the French masculine noun flâneur—which has the basic meanings of "stroller", "lounger", "saunterer", "loafer"—which itself comes from the French verb flâner, which means "to stroll". Charles Baudelaire developed a derived meaning of flâneur—that of "a person who walks the city in order to experience it". 1. Of or relating to an elegy (a mournful poem or song, especially one mourning a dead person). I loved Paris Was Ours. I felt transported to Paris, where a culture that's always perplexed me (as I have French roots, I really desire to understand the French) was explained with flair and erudition. 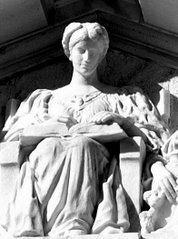 A glossary of French terms and a little better context in the form of a lengthier bio placed just before each writing would have been helpful for the reading of most of the essays -- some authors did translate French expressions, but most did not. Highly recommended for all readers but particularly for those who have a fascination with France in general or Paris in particular, or the armchair traveler who loves learning about other cultures. I'm going to loan this book to my son, who spent several weeks in France and will undoubtedly enjoy Paris Was Ours. I intend to reread it, eventually -- next time, with a French dictionary or a computer handy. I loved Jeremy Mercer's essay, "My Bookstore High", an excerpt from his book Time Was Soft There, about the time he spent living in Shakespeare and Company. Judith Warner's "Toward a Politics of Quality of Life," is a fascinating comparison of American feminism vs. the kittenish, pouty feminism of the French that I think would be of particular interest to those who are participating in challenges involving feminist issues. There are several essays in which the acceptance of sexual orientation is mentioned but I didn't mark them. However, I was particularly interested by a comment that if a gay couple is invited to a party in New York, someone will seek them out to reassure them that they're very welcome, while in Paris the same couple will find themselves treated like everyone else, their orientation accepted to the point of being nothing of any interest. I found Stacy Schiff's essay, "In Franklin's Footsteps" amusing and informative. And, I kept thinking to myself, "Stacy Schiff, Stacy Schiff. Where have I heard that name?" I looked her up and discovered that I have her biography of Antoine Saint-Exupery. It just happened to be sitting in a prominent place in the den because I pulled it off a shelf and set it aside, thinking, "I've got to read this one!" while cleaning some shelves, about two weeks ago. Gushy thanks to Michael of Algonquin Books for the copy of Paris Was Ours. 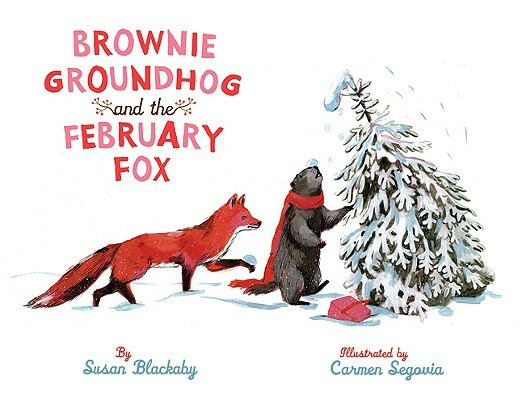 Tomorrow I'll review Brownie Groundhog and the February Fox by Susan Blackaby, another surprise book, this time from Sterling Kids. It's a book that I love so much I fear my cats are going to get sick of it, sometime soon. Well, I have to read it to someone! He seems like a simple man, only I don't really believe that. Nobody who says a little as he does is as simple as you'd think. "Right." He laughed and turned the engine off. "Let's go somewhere else." "Don't you need the engine on to do that?" I asked. "We're not driving," he said, and climbed around the driver's seat and into the bus. "So, let's see . . . where should we go?" He moved his finger along the spines of the books in the travel section and walked alongside them, reading aloud, "Paris, Chile, Rome, Argentina, Mexico . . . "
"Mexico," I said straightaway, kneeling up on my seat to watch him. "Mexico." He nodded. "Good choice." He lifted the book from the shelf and looked at me. "Well? Are you coming? Flight's about to leave." I smiled and climbed over to join him. We sat on the floor, side by side, in the back of the bus, and that day, we went to Mexico. Tamara Goodwin has been spoiled all her life, living in a mansion with hired help, free to do as she pleased with her friends and given anything she desired. But then tragedy struck and now her world has been shattered. Her father's hidden debts have caused Tamara and her mother to lose everything after his death; and, they have no choice but to move in with Uncle Arthur and Aunt Rosaleen. Far from the city, isolated in the Irish countryside, Tamara's bored and frustrated. Her uncle hardly says a word and her aunt is oddly sweet, tremendously cagey and almost stalkerish, keeping Tamara away from her own mother, swooping things out of her sight, hushing conversations when she knows Tamara's around. When Tamara meets a young man who drives the local library on wheels, she finds a kindred spirit and a magical book that tells her what's going to happen . . . in her own handwriting. A second boy also catches her eye in the ruins of the castle upon whose property they live. The two young men and a nun who knows the history of the ruined castle and everyone in town all help Tamara tolerate the place she lives. But, what is the secret Aunt Rosaleen is so determined to keep from her? 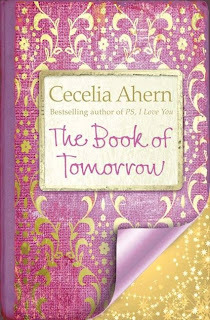 The Book of Tomorrow is a story with a little magic, a touch of romance and a little mystery. I must confess, I started reading The Book of Tomorrow and immediately hated the heroine. 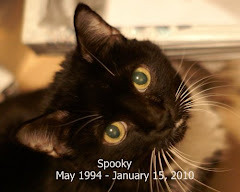 She was a spoiled brat who deliberately made people uncomfortable and was determined to be unhappy in her new home. It's very telling that my son picked up the book and read a few pages but rejected it while we were sitting in a restaurant. He's one of those people who will read anything -- even the ketchup bottle -- when there's nothing to do but sit. But, he handed the book back to me, declaring it a "whining book". He preferred twiddling his thumbs to reading it. That's exactly how the book feels, at the beginning, and I was tempted to throw in the towel, even though I love books set in Ireland. But, then the young man who drives the library bus came into the picture and Tamara found a magical diary. I was curious and I kept reading. It was mostly the magical book that kept me going -- the questions I had about it, in particular. The author dropped a hint that the nun knew something about the book and the castle. But . . .
To be honest, the idea was far better than the execution. There were hints that were not followed through, something very bad happens to one of the boys and he almost completely disappears from the picture (the one I liked the most, naturally), and in the end the entire mystery is explained all at once. Hints dropped throughout the book never entirely make sense. Tamara never actually sits down to write in the diary, which is I think one of the strangest things I've ever read in a book with some sort of paranormal aspect. Wait--she finds her own writing in a book, telling her what's going to occur, but there is never a point at which she actually writes a word? Yep, she only reads her own writing, never actually lifts a pencil or pen to the pages. When Tamara causes one guy to drop out of the picture, it's by doing something she knows is wrong. So, as a heroine, she's not only a spoiled, spiteful, horrid person but she doesn't really transform. There are hints of improvement but there's no lasting redemption. I think a blogging friend who chose not to review the book because she couldn't think of anything positive to say about it was right when she called it, "a hot mess". Close to the end of the book, Tamara the Narrator says, "I spoke with venom," and you know she's still the same old brat. She doesn't even have the sense to solve the mystery on her own. I read all of The Book of Tomorrow and was massively disappointed. The best thing I can say for it is that it's a quick read. The story is flawed and incomplete with a too-easy mystery solution and a dreadful heroine. There are several holes in the plot -- bits that don't make sense if you question them too deeply and I always do that. I don't know what Cecelia Ahern's fans will make of it, but I think they're the only people to whom I'd recommend this book and only because I assume a few people will want to read it merely because they like Ahern's writing. I loved P. S. I Love You and am listening to it on audio. There is some similarity in that Tamara, like the heroine in P. S. I Love You, is grieving. I cut her a little slack at first, thinking she would improve. But she didn't and The Book of Tomorrow is a big disappointment. My thanks to HarperCollins for the Advanced Reader Copy of this book, which I will pass on to a friend. Tomorrow's book is unfortunately also a DNF, but I promise you I gave it a fair chance. I'd rather read 75 pages and abandon a book than read the entire thing and realize how much time I've wasted. I'm too old for that. My Thursday post will be about either Paris Was Ours or Brownie Groundhog and the February Fox -- two books I absolutely loved. I've always been a fickle reader, prone to read only so far and then abandon books but then return to them for a 2nd or even a 3rd try. It's just how I read, really. If a book doesn't grab me, I'll often have trouble forcing myself through it -- and, yet, 6 months or a year down the line I might find that same book becomes a personal favorite. Great Expectations is one of my favorite examples. I didn't get very far on the first 2 attempts but on the 3rd attempt the reading went quickly and I absolutely loved it. Since history has shown that I will be less likely to like or positively review a book if I shove myself through the reading, I've continued to abandon those that don't grab me, although I do fight guilt when I set aside Advanced Reader Copies. Here are a few that have recently fallen into the Did Not Finish category, why I didn't finish them and whether or not I plan to give them another go. 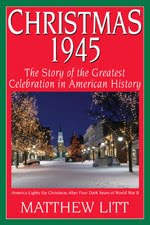 I got Christmas 1945 from History Publishing Company, a small press I'm quite fond of, unsolicited. The portion I read was really enjoyable -- very illuminating. I set it aside around Christmas because I was feeling a little overwhelmed with the seasonal doings and then decided I didn't much feel like reading about Christmas after Christmas ended. No surprise there. While I did think it was a little on the dry side, it's a book I will definitely return to -- probably when it gets hot and I want to think about the cool time of year. WWI, the Great Depression, WWII and the post-war years are all of particular interest to me, possibly because my parents and grandparents lived through them, but also because I've always been very impressed with the gumption of people who lived through those major events. 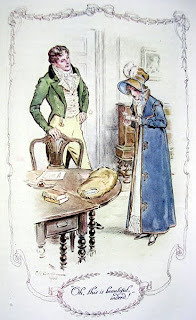 Mansfield Park by Jane Austen - The first ebook I attempted to read from the beginning (I read a bit of Peter Pan on my husband's iPad, last year), I thought Mansfield Park was okay but I've discovered something fascinating: I'm really not an ebook type of gal. I have a tendency to pick up the paper books and forget I'm reading an ebook. Hmm. This is something I've never seen mentioned by other bloggers. At any rate, I was chugging along just fine but not finding Mansfield Park the most enjoyable Jane Austen I've read and it seemed to be awfully easy to set the book aside. So, I finally decided I'll come back to it another time. I was encouraged by a few friends who told me Mansfield Park is their least favorite work by Austen. I also own a paperback copy of Mansfield Park, so it'll be interesting to see whether I end up reading the ebook or the paper copy when I return to it. 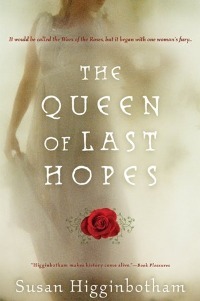 The Queen of Last Hopes by Susan Higginbotham is a perfect example of Bookfool's Moody Reading. There is absolutely nothing wrong with the book -- nothing at all I dislike about it. From the first page, Margaret of Anjou was a compelling narrator. When I began reading The Queen of Last Hopes, however, I knew it was going to be a struggle simply because I wasn't in the mood to read historical fiction. Since the book is an Advanced Reader's Copy I received from Sourcebooks, I forged ahead and made it about 30 pages. Then, as often happens when I'm not really in the mood to read a particular book, I set it down and didn't pick it back up. After about 10 days of looking askance at the book, I picked it up again and reread the same 30 pages. Same thing, round 2. 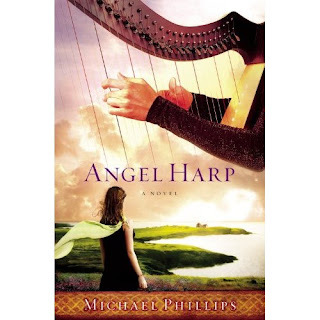 I just wasn't in the mood for a large-cast historical fiction -- and it might at least partially have to do with the fact that I've read a lot of medieval fiction in the past year. Again, I plan to return to the book and I hope to read it as soon as humanly possible. I like Higginbotham's writing style and The Queen of Last Hopes is a story I've been looking forward to reading. I'm really quite fascinated by my inability to force myself through a book if the timing is wrong. There are two books in my sidebar that I'm struggling with and which will probably soon disappear. One is the gluten-free French cookbook by Chef Alain Braux: Living Gluten and Dairy-Free with French Gourmet Food. Like Mansfield Park, the "struggling" can be wholly blamed upon the fact that it's an ebook and I keep forgetting it's there. I plan to have that one printed and bound, as soon as possible, because I honestly am dying to read it -- I loved Alain Braux's first cookbook; we're still using it -- and we want to try the recipes but I just can't talk myself into bothering to look at it on the reader. This is very frustrating. I hope my reader doesn't become a toy that only gets used for checking email and reading during vacations. I don't even leave home very often!!! The other book I'm having trouble with is The Procrastination Equation by Piers Steel, PhD, an ARC from HarperCollins. I have no specific policy about what page number I'll read to before abandoning an advanced reader but I recently read a favorite blogger's policy and decided 50 pages, her stated minimum, is a good number to shoot for. I'm finding I tend to quit around page 30-50, anyway, if a book isn't clicking with me, but I think it's very reasonable to read at least 50 pages before abandoning a book and I'm attempting to do so with The Procrastination Equation. Guess what page I stopped on? Go ahead, guess. Ahhh. 30 pages. Figures. If I stop reading The Procrastination Equation, it will not be a book I return to because at this point I'm finding that I have a strong desire to give the author's marvelously oversized balloon ego a good pop. His arrogance is seriously annoying. In addition to that, I'm finding the whole equation thing is not explained well at all. The idea with this kind of book should be to create a practical guide to enacting change in the reader's life, a simple way to put improvement into effect, right? I'm not seeing it. But, as I said, I'm going to give it another 20 pages to see if it becomes more readable after the initial explanation of the "equation" that's supposed to help me stop procrastinating. Speaking of which . . . I'm actually doing pretty well at getting things done, lately, anyway. I just added up my "Books In" for the last 5 weeks and subtracted the number of "Books Out", then came up with a net figure. 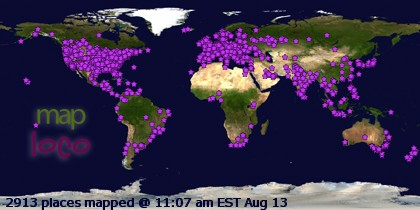 In 5 weeks' time, I've received quite a few books but my net has been 103 books out the door. Wahoo! I think 20 per week is a solid start. I've still got a long, long way to go but we're also getting rid of clothing we no longer wear and games we don't play, so we've opened up a good bit of space in our little home, already. It's been really helpful having Kiddo back in the house. His presence is motivating me to get the job done so he doesn't have to worry about clutter and can just focus on studying. And, now I leave you with Izzy under the dresser, your daily dose of Kitty Cute. Isabel is unfairly taking the top slot, today. This is an unlikely shot. Like most kittens, she's either going full-speed and appears a candidate for the feline mental asylum or she's comatose. In this case, she flopped down to rest for a minute and I just happened to have a camera handy. My memory card is actually full, so I've got to back it up and empty it. I really didn't take many kitty pics, this week. And, here we have a photo of Fiona that's a couple months old. She looks pretty serene, doesn't she? Well, that hasn't happened, today. Today, my gentle Fi has been having a grand time playing Chase Through the Tunnel. But, I had to post something because it's Fiona Friday, so there you go. It is 1813. Adela McGirth lives a comfortable life in her family's Georgia plantation. Of the three sisters, she is the calm, level-headed one and pretty enough to have drawn a number of suitors. Till Phillip Bailey set his sights on her, none has even slightly interested her. He's determined to marry her, but Adela is conflicted. Then, suddenly, life takes a dramatic turn as war breaks out between the peaceful Creek nation and white settlers. When the danger becomes too great, local settlers move into a fort for protection. But, the leader is lazy and disorganized. It's only a matter of time before the fort will fall victim to attack by the Red Stick faction. Captured by Indians, grieving the loss of loved ones, Adela eventually finds herself starving in the wilderness, facing a dilemma that only God can help her solve. There is so much more to this book than the brief description I just wrote, above. 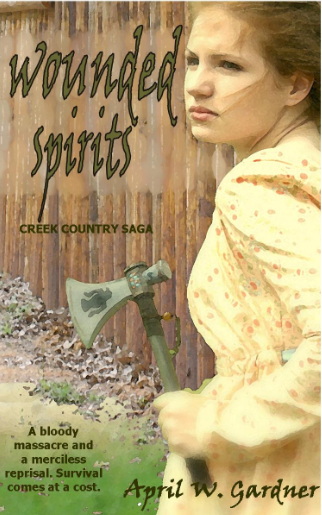 Wounded Spirits begins from Adela's perspective and then switches to the point of view of a Creek warrior named Totka, who has a gimpy leg and a gentle spirit. Adela is kind-hearted and godly; Totka is loving and only fights because he must. You get a good glimpse of both sides of the tale, which is based on the true story of the McGirth family, some of whom were captured under the guise of becoming slaves by an Indian who was at one time orphaned and raised by the McGirths. Nokose, the former orphan, is brother-in-law to Totka. After Adela and some of her other family members are captured, apparently the only survivors from the fort, they are treated harshly but Adela learns the language and eventually falls in love. Her father, Zachariah, was away from the fortress to check on the livestock at their plantation during the massacre. Returning to find nothing but bodies -- some unrecognizable -- he assumes his family has been killed and responds by following the army, exacting revenge on the people he thinks responsible. Author April Gardner has done an amazing job of giving readers a full perspective of this real-life eruption of war between Native Americans and encroaching settlers. She's done such a marvelous job of allowing readers to peer into both camps that it's impossible to take sides. Although it took a while for the story to turn from what seemed to be a romance to an action-packed tale of conflict and violence, once it got going it was hard to put Wounded Spirits down. There is a tremendous amount of nail-biting action, a slow and believable build-up of interest between Adela and Totka, and excellent character development, all-around. The setting is believably rendered, the emotions right on, the senses well done. You will love Adela and care what happens to her and her family. But, you'll also care for Totka and his loved ones. When there's slaughter on both sides, it's heart-breaking. I know next to nothing about the time and place, although some of the regional names are familiar to me, but from the author's notes I gather that she did her homework and it shows. There's a definite ring of authenticity to the story. You're going to think I'm confused, now, because I've just gushed so thoroughly. But, Wounded Spirits is not perfect. It is slightly rough and reads, at times, like the work of a new writer. Stylistically, the writing is straightforward rather than lyrical. There are plenty of errors that should have been edited out -- mostly misspellings, possibly some typos. But, in the end, the story wins out and its flaws virtually fade into the background. I loved this book. I adored the characters, cared for people on both sides and found myself gripping the pages and sometimes wiping away tears. There's a little bit of "hokey" and a lot of Christian reflection because Adela's Christian and it's her faith that gets her through a year of life starving in an Indian camp. While not perfect, the book is nicely balanced between action and quieter internal or daily life scenes. The author gives readers an unbiased look at the two sides of war and the story wins out over the writing flaws. Definitely recommended. You can read a free chapter of Wounded Spirits, here. The cover is a little cheesy, but I like it. There is a scene in which the McGirth girls must fight for their lives and an axe is involved . . . and I do think the cover model fits the description of Adela perfectly. I'm pretty happy with my reading, so far this year, and the fact that I'm keeping up with my reviews. But, I realize I still haven't gotten to that 2010 Favorites business. If you saw a mostly-empty 2010 Favorites list pop up in your reader, it's because I got started writing the basic skeleton and then hit the wrong button when I meant to save my progress in draft form. Sorry about that. I'll finish it eventually, but it might be 2012. I hope not. In the meantime, I've got some recent DNFs to talk about -- why I stopped reading them and whether or not I'll give them a second chance, as always. I'll review The Book of Tomorrow by Cecelia Ahern, after that, and someday I'll give a Books In/Books Out report, but I've fallen so far behind on that I'll probably only photograph the most recent arrivals. The good news is that Books Out are still surpassing Books In about 2 to 1. Go me. The Mental Floss History of the United States has been lingering in my sidebar for-freaking-ever because it's written in short sections and I'm reading it in bits and spurts. Still. I've mentioned that, before. I haven't set it aside or forgotten about it. I'm just taking my time reading it. It's a hugely entertaining book and it might take me another month because I want to extend the joy, but I can already tell you I'll highly recommend it. So, just go buy a copy if you like your history handled with levity. It's a very fun read. Let's get this out of the way, first . . . the title is weird. "Fast" and "diet" do not mean the same thing, in my mind. The free chapter of The Daniel Fast Made Delicious explains the reasoning behind the use of the word "fast" which, briefly, is simply a usage that a particular church came up with when its members sought out a way to set aside a time in which they weren't necessarily doing the regular starving-fast/prayer thing but were focused on God and eating in a way that would please Him. The idea came from Daniel's diet from the Bible (Daniel 1: 8-21) in which Daniel and his little gang said they'd stay with the king but only if they didn't have to eat the king's food, eating only vegetables and water, instead. 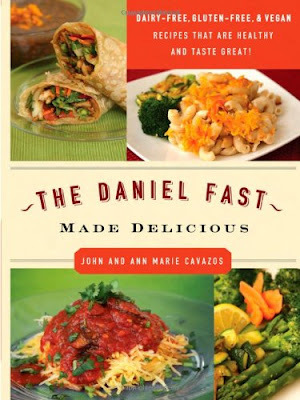 As that particular church made its "Daniel fast" a regular event, the authors of this book tried to find ways to make the food they were limited to more palatable. It took several years and a lot of trial and error (their family and church members were apparently the guinea pigs) but they eventually created enough recipes to make not only a temporary diet but a lifestyle change as they discovered that the general church population was losing weight and having fewer health issues (particularly stomach and intestinal), to boot. There are two sections in The Daniel Fast. The first contains recipes that fit the diet strictly and the second has recipes that are healthy, gluten- and dairy-free, and vegan but not quite as strict in that they add a few things that are restricted in the "fast" portion of the book. I haven't read the entire cookbook, cover to cover, but I read quite a few of the recipes and we tried two of them. When I say, "we", I'm saying it with a bit of a lopsided grin. My part was exhausting -- I wrote down the ingredients husband needed to purchase and then went to bed and moaned because I had a stomach virus while he bought, chopped and put together everything. Before we got our spanking new Kroger, I'm pretty sure a good portion of the special ingredients like egg-free mayonnaise (we didn't have the brand mentioned in our store, but husband found something similar) would have been unobtainable and there are still plenty that can't be found in our area. If you don't have easy access to such things and aren't willing to order ingredients, drive out of your way or alter the recipes a bit, this book is probably not for you. Things like gluten-free tortillas and rice cheeses (which, actually, we could make -- it's just cheese made from rice milk rather than cow milk) are among those we'd have to hunt down in the Big City -- that means a 50-60 mile drive, which isn't worth it for regular, everyday meals but at least it's within reach. And, there's a fruit salad recipe that contains about 15 different fruits. On the best of days, a lot of the berries mentioned go straight to mold when they get to us (because they travel so far) and are outrageously expensive, anyway, so that one's just not possible, period. But, veggies are abundant in variety and readily available -- and they're the main ingredients comprising most of the recipes included in The Daniel Fast, so we were able to give a couple recipes a trial run and will make more in the future. The two we chose were "Annie's Pumpkin Lasagna" and "Brown Rice Tortilla Vegetable Wraps". There were no gluten-free tortillas to be found, so we just used the healthiest tortillas available (who knows whether they are what they claim) and there was some other minor tweaking but the end results were spectacular. I was shocked at how flavorful both recipes tasted. Here's the really interesting part, though. On Sunday, I was still having some lingering after-effects from my stomach virus, so my husband offered to make me some rice. If you've got kids, you probably know why -- the B.R.A.T. diet (bananas, rice, applesauce, toast) is well-known as a gentle way to ease kids back into eating after intestinal illness. Well, guess what? Rice didn't go over well at all and I ended up napping with a heating pad on my sore belly. Later in the day, though, husband finished cooking the pumpkin lasagna and I was able to eat it with no problem, whatsoever. Wow, that was a surprise. Later that night, I was feeling a bit better and by then he'd thrown together the wrap recipe, so that was next. Again, no problem. Then, I ate something typical on Monday morning and went into total relapse. Right now, I'm eating leftover pumpkin lasagna and veggie wraps -- and pretty much nothing else. I'll stick with what works, thank you very much. Stunningly flavorful recipes and tips for how to adapt after the initial diet make this gluten-free, dairy-free, vegan cookbook a winner but some ingredients may be hard to find. There are lots of explanatory notes and additions ("What's a quinoa?" "After-the-Fast" tips, and "Optional Mint Sauce" are a few examples) that I found really helpful. Not being much of a cook, I found that I had a lot of questions but 90% of the time they were answered before I moved to the next recipe. There are some photographs -- not every recipe has a photo, but many of them do. Since they tend to be pretty basic, with fresh foods and lots of chopping, I don't think absolutely every recipe needs a photo. My husband agrees with me on that and was also pleased with the results. We have not yet talked Kiddo into trying either recipe, unfortunately. But, we'll keep working on him. He's been in a gummy worm mood, today. Um, yeah. Healthy. So . . . speaking of rice . . . were we speaking of rice? It was mentioned, I guess, and that made me think of something totally cool that I think is worth sharing. You know the site where you can go click on various buttons to donate food and books, feed shelter animals, etc.? I go there daily to do my clicking and one day I gazed into the sidebar, where they have their little market, and saw a tote bag made with cloth from an old sari was advertised. They looked pretty and were reasonably priced (plus, your purchase buys 50 cups of rice for a hungry child) and I occasionally buy a new tote bag for my Bible-study toting, so I got one. Isn't that gorgeous? The bag is mostly black satin with one side made up of reclaimed sari fabric. I'm so in love with mine that I ordered another one for a friend who has admired my current Bible study tote, which is sequined (we both love shiny things) and kind of funky. I just thought I'd share that with you. You might see books posed on that bag, in the future.